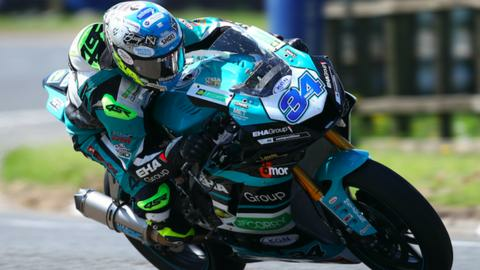 Alastair Seeley will compete for EHA Racing in this weekend's British Supersport round at Silverstone after MV Agusta withdrew from the series. The Carrickfergus man was left without a ride for the rest of the season following Agusta's decision, which was taken for budgetary reasons. However, EHA Racing has come to Seeley's rescue for one round and he will race on a Yamaha YZF-R6. "We can be racing at the sharp end - I'm looking forward to it," he said. Seeley, who has earned a record 24 North West 200 wins, only signed for the remainder of the British Supersport season in July after starting this year in the Superstock 1000 class. Silverstone is followed by the closing three rounds of the series then take place at Oulton Park, Dutch venue Assen and Brands Hatch. "To be honest it's the one ride I would have picked, had there been a choice," added Seeley. "I really enjoyed riding the EHA Racing Yamaha back in May - at both the North West 200 and also in testing the following week. "It's a competitive package and despite only agreeing the deal on Thursday, I'm confident we can tweak the set-up to suit me."